Skylark sings a new song! Born among the gentle hills of Fintona, Co Tyrone Northern Ireland, Líosa soaked up song at her Daddy’s knee. From then on there was no stopping her. She quickly progressed from taking lessons with Patricia and Rosemary Nugent, family members of the Irish traditional music dynasty headed up by the late great fiddle player, Sean Nugent, to learning from the man himself. Sean immediately spotted Líosa’s potential and before long she was winning prizes in solo, duet, trio and ceili band competitions throughout Ireland. At the same time she added other strings to her bow by taking up the fiddle and developing her vocal powers. Before embarking on her professional career, Líosa studied musical theatre at Blackpool and the Fylde College in England. Then, in 2002 she debuted as lead vocalist with Rhythm of the Dance which springboarded her into touring over 30 countries with acclaimed Irish Dance and Music shows such as Gaelforce Dance, The Spirit of Ireland, Dance of Desire, Celtic Feet, The Rhythms of Ireland and renowned harpist Dearbhail Finnegan’s Celtic Isle Celebrations and Feet of Fire. 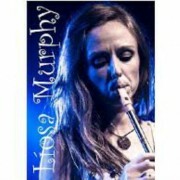 All the time she was on the road, Líosa was conscious of wanting to develop her own unique approach to Irish music: of giving the tradition a contemporary edge by mixing it up with percussive styles from other musical cultures; of testing the boundaries, going to the edge and daring to step over to create a new sound journey for Irish traditionalists. On her return to Ireland she relocated to Donegal so that she could work with well-known producer Kevin Lowery and musicians Brian Sweeney, Allan Cooke, Seanan Brennan, Jamie Carswell and Damien McGeehan. In Eden Vella Studios Líosa’s exciting vision was made reality with the recording and release of her album Skylark. Skylark takes Irish traditional music to a whole new level; seamlessly marrying electro pop, African rhythms and vocal percussion to well-loved songs and tunes. In her version of Nancy Spain (track 2) Líosa risks taking this popular and beautiful song and giving it a funky fusion with an electro pop beat throughout so that its timeless refrain “No matter where I wander I’m still haunted by your name” speaks to a whole new generation of lovers who have loved and lost. The Skylark whistle set (track 7) has compelling African cross rhythms driving its passionate momentum. While in Drunken Landlady (track 10) she teams seemingly effortless swift but mellow whistle playing with wordless vocal percussion to ramp up the track’s emotional appeal. Líosa’s own whistle tune, The Kinlough Fairies (track 6) is also on the album, featuring her trademark, inspirational, improvised backing vocals. Skylark’s surprising, multi-layered take on Irish traditional is already making waves and is a big hit with fans old and new.